The Nefertiti/Rattlesnake Canyon trail is located along the Green River at the end of the Hastings Road north of Green River, Utah. 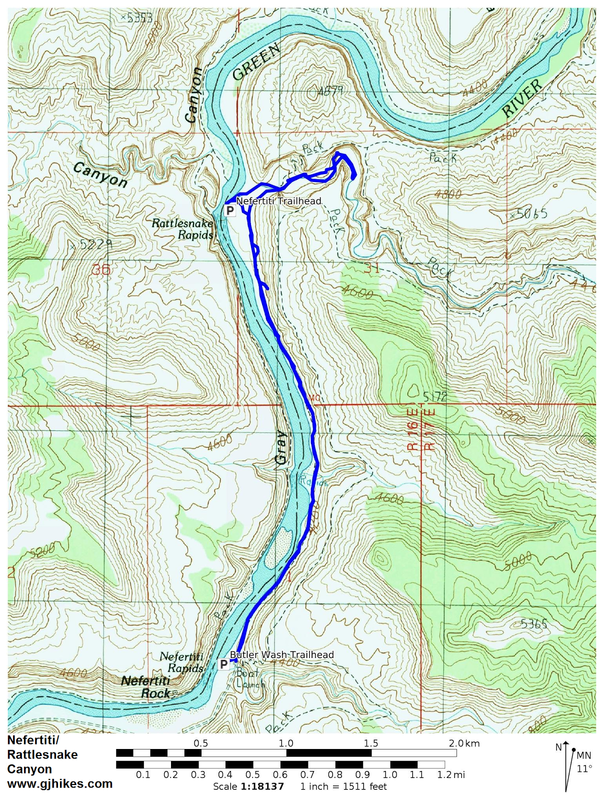 The trail begins at the Nefertiti Day Use Area where it follows the east bank of the Green River for several miles to the mouth of Rattlesnake Canyon. From there the trail turns up the canyon and if followed long enough will eventually lead back to the Hastings Road at a point just outside of the town of Green River. We estimate the total distance for a grand loop that combines Rattlesnake Canyon, Tusher Canyon and the Hastings Road to be no less than 48 miles. For this post we began at the Butler Canyon trailhead and rode our mountain bikes to Nefertiti where we hiked up the river to Rattlesnake Canyon and explored the first half mile or so of the canyon before turning around. The round trip distance for the hiking portion was about 5 miles and MTB was 10 miles for a combined distance of 15 miles. To get to Nefertiti from the town of Green River turn north onto the Hastings Road off of East Main/Old Highway 6 & 50. Follow the Hastings Road for 18 miles. The first few miles of the road are paved but the road soon turns to gravel and then to dirt. As you follow the road along the east bank of the Green River you will pass Swasey's Boat Ramp and the Lower Grey Canyon Campground. After several more miles you will pass the Stone Cabin Day Use Area and then Butler Canyon. There are restrooms at each of the spots that we just named. We were uncertain of the road conditions past Butler Canyon due to heavy rains so we parked there and rode our mountain bikes for the last 5 miles to Nefertiti. Being on our mountain bikes allowed us to easily spot a large boulder on the east side of the road that was well adorned with petroglyphs. The petroglyphs are within 50 feet of the road and they face it so they shouldn't be too hard to spot. We had noticed one other petroglyph site along the road while driving in and there may have been others that we didn't see. The road ends at Nefertiti where there is another restroom and the Rattlesnake Canyon trailhead. 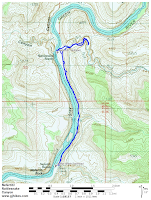 For the most part the trail along the river is easy to follow but it can get a little tough to hike in places. Parts of the trail are crowded out by brush and overgrown by willows. The fun part about that is that there are bears along the river corridor so you have to keep a sharp eye out and keep your ears open. Before reaching the mouth of Rattlesnake Canyon the trail has to climb over a small cliff. For this hike the river was low enough for us to stay down along the bank on a sandbar where we had to make our way through a very thick growth of willows and salt cedar. Care should be taken before using the sandbar to make sure that it is solid enough to walk on. If the water is rising the sandbar can liquify beneath your feet. I had that happen to me in Alaska and I had a heck of a time getting free. As you can see in the picture it doesn't take much for the edge of the sand to collapse into the water so stay away from that also. The river looks like it has a laminar flow at this spot but the current is still very swift. After that little tight spot the canyon opens up quite a bit and the trail gets a lot easier. Around the 2 mile point from the Rattlesnake trailhead the mouth of Rattlesnake Canyon is reached. We hiked up the canyon for less than a mile before turning around. We will keep the rest of the canyon on our list to explore on another day. Back at the mouth of the canyon there are some good primitive campsites along the river. We also came across a mamma bear and her cub near here that ran into the willows as soon as they saw us. Rather than go in after them for a picture we gave them a wide berth and headed back downstream. There are a few places along the river with a thick growth of poison ivy. The trail doesn't really go through any of the stuff but if you get off the trail on the river side be sure to watch out for it. As it turned out we probably could have driven all the way to the Nefertiti area in our 2-wheel drive Ford Ranger but there turned out to be some good advantages from our slower mode of transportation. Besides the petroglyphs that we noticed there was also a small herd of bighorn sheep. We had been seeing bighorn tracks occasionally while hiking on the trail and ended up being a little bummed when we got back to the trailhead and hadn't spotted any of them. But lo and behold, across the road from Nefertiti we found some climbing around on the rocks. As long as we kept our distance and used our zoom lens the bighorn seemed more than happy to hang around and pose for numerous pictures. We were also on the lookout for any ruins such as granaries but we didn't spot any. There is a short walled structure of stacked rocks at Nefertiti but it has been messed with so much that it is hard to associate it with the typical ruin one might come across in the area. This hike is one that is interesting to do if you happen to be in the area but maybe not worth going too far out of your way for unless like us it is an area that you have been wanting to explore. If you would like to see it for yourself then all you have to do is 'Take a hike'.